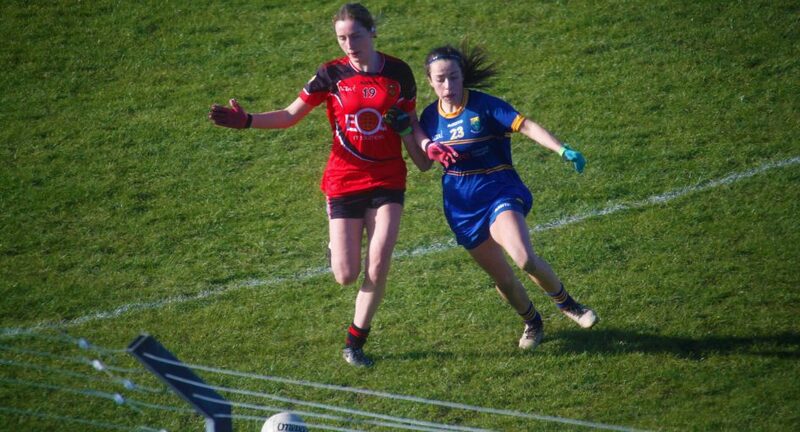 Laura Hogan was in sumptuous form as the Wicklow lady footballers claimed an impressive win against Down on a historic Sunday afternoon in Aughrim. The Tinahely and Wicklow full-forward took full advantage the wind-swept conditions to contribute 1-11 towards her side’s final tally, with all of her points coming from frees as she took advantage of a whistle-happy referee. That sharp-shooting, as well as inspired performances from the likes of Laurie Ahern, Lorna Fusciardi Hayden, and Sarah Miley proved too much for Down, despite the Northern outfit scoring two late goals through Orla Swail and Jessica Foy. The story of women’s football in Wicklow took a historic step forward on Sunday afternoon, as the county male and female footballers shared the Joule Park turf on the same day for the very first time. With the spotlight on James Kelly’s side, they rose to the occasion, and then some. The tireless Laurie Ahern kicked off the afternoon’s proceedings with a point inside the first two and a half minutes. Despite Down levelling matters soon after, and Kim Connors having to make a good save to deny the dangerous Laoise Duffy a goal, Wicklow retained control with a trio of frees from the undeniable Laura Hogan. Irrespective of the lead, the Wicklow back-line were put under frequent pressure by the runs from deep of Down midfielders Laoise Duffy and Aoife Keown. The pressure told with 12 and a half minutes on the clock, when Keown charged into the area and unleashed an unstoppable shot into Connors’ top right-hand corner. Rather than shy away from the set-back, Wicklow rebounded through a well-taken point by Clodagh Fox following quick inter-play between Lorna Fusciardi Hayden and Sarah Miley. Hogan’s fourth of eight first-half frees put Wicklow into a two-point lead before Down get their next score through a Duffy free. Down wouldn’t score again for the remainding 12 minutes of the first-half, as Wicklow capitalised on the windy conditions to stretch further in front. Four more Hogan frees, broken up by an excellent Amy Murphy point coming off the right-hand side, and Clodagh Fox’s second score of the afternoon, sent the Garden into the half-time interval with a seven-point 0-12 to 1-02 lead. All of this despite Sarah Delahunt and Jessica Nolan Byrne being sent to the sin-bin on 16 and 24 minutes respectively. Down needed an immediate response in the second-half, but it was Wicklow who came flying out of the blocks. Laura Hogan and Amy Murphy both put the ball wide, before the former split the posts with yet another free. Delahunt, back on the pitch following her time in the bin, missed the target following more clever interplay between Hayden and Miley. That pairing would come to the fore once again four minutes into the second-half for the match-sealing score. Following a spell of possession with Hayden and Miley at the heart, the ball was lifted into the Down area. Here, Clodagh Fox poked the ball towards goal, only for Aisling Cull to deny her. The ball fell kindly to Hogan, however, and she made no mistake as she scored to put Wicklow into an 11-point lead with 26 minutes still to play. Two straight sin-bins for Down in as many minutes threatened to derail the visitors, as Wicklow looked to have their way with the opposition. A pair of frees from Hogan took her tally to 1-10, before Laoise Duffy and Aoife Keown once again combined, only for Kim Connors to deny the latter with a good save. The Blessington shot-stopper could do nothing moments later when the impressive Orla Swail sent her the wrong way it a shot into the bottom right corner of the net. At this point, with less than 10 minutes left on the clock and nine points between the two sides, it was little else by consolation for Caoibhe Sloan and Peter Lynch’s Down side. Anna McKee put the ball over the bar well from out on the left, before Jessica Foy bundled in their third goal of the day after Swail had smashed the bar with a shot. Ultimately, Wicklow would have the final say on proceedings, Clodagh Fox scoring the final point of the game after a typically surging run from deep by Laurie Ahern. Three minutes later, the referee called time on proceedings, giving Wicklow their first division three points of 2019. WicklowNews Player of the Match: Laura Hogan. Wicklow: K. Connors; E. Mulhall, S.j. Winders, A. Gillen; L.F. Hayden, S. Hogan, J.N. Byrne; N. McGettigan, S. Delahunt; M. Deeney, L. Ahern, S. Miley; A. Murphy, L. Hogan, C. Fox. Replacements: A. Byrne (for S.J. Winders), A. Gorman (for M. Deeney), T. Dowling (for A. Murphy). Scorers: L. Hogan (1-11; 0-11f), C. Fox (0-03), L. Ahern (0-01), A. Murphy (0-01). Down: A. Cull; E. McArdle, C. Byrne, C. Doherty; O. Duffy, K. White, M. Kavanagh; L. Duffy, A. Keown; L. McNamee, A. Trainer, S. Dougherty; L. Cunningham, A. McKee, T. Poland. Replacments: N. McKibbin (for C. Doherty), A. Magee (for M. Kavanagh), O. Lavery (for L. McNamee), O. Swail (for T. Poland), J. Foy (for S. Dougherty). Scorers: A. Keown (1-0), O. Swail (1-0), J. Foy (1-0), L. Duffy (0-02; 0-01f), L. Cunningham (0-01f), A. McKee (0-01).